Weather: Blustery and sunny but with occasional heavy showers of rain and hail. Double click on maps or photos to enlarge. 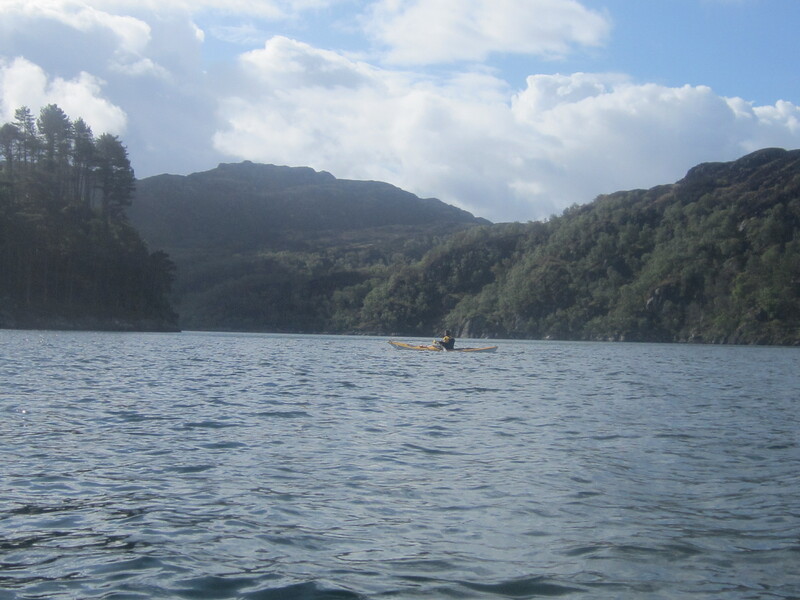 Report: The wind report was not favourable so it was decided to head for the sheltered waters of Moidart. 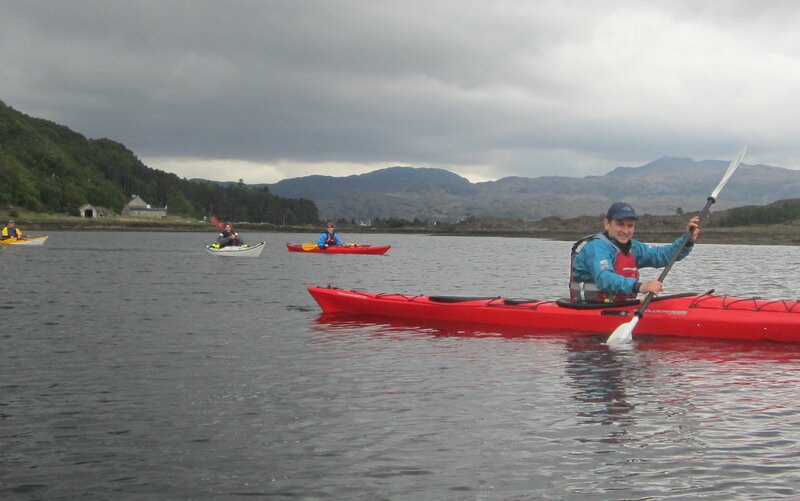 This remote and stunningly beautiful area is deservedly popular with sea kayakers, the club having been here in 2012 and 2014 http://www.helensburghcc.org.uk/2012/07/05/moidart-and-ardnumurchan-july-2012/and http://www.helensburghcc.org.uk/2014/09/22/moidart-september-2014/). 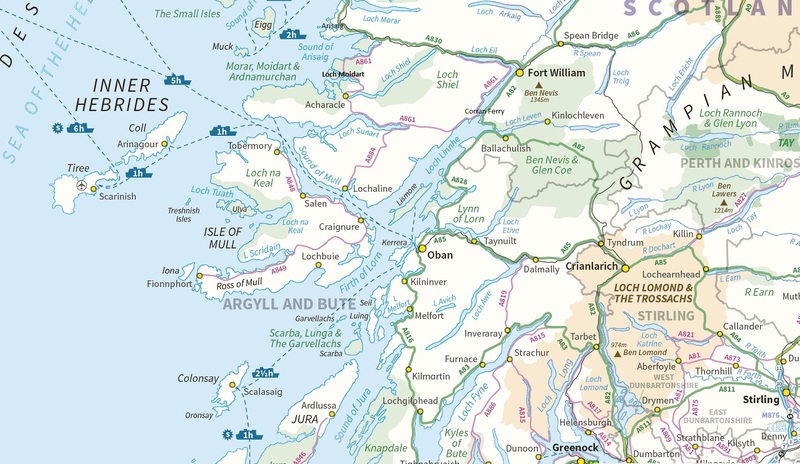 The journey up was something of a nightmare with heavy summer Saturday traffic and the legacy (10 miles of stop/start) of a lorry crash on the A82 north of Tarbet. Launch sites are difficult and the original plan was to come in from Glenuig, but the wind acted as a deterrent so we headed for the car park opposite Castle Tioram. One problem with the loch is the extensive sand areas as the tide falls and at the car park we faced a substantial walk over the sand to reach the water. Instead we drove up the river to unload and then put the cars back in the car park. After the major delays en route we eventually put in at just after 3pm. It was necessary to follow the river bed through the sand flats until we could turn west towards the sea. 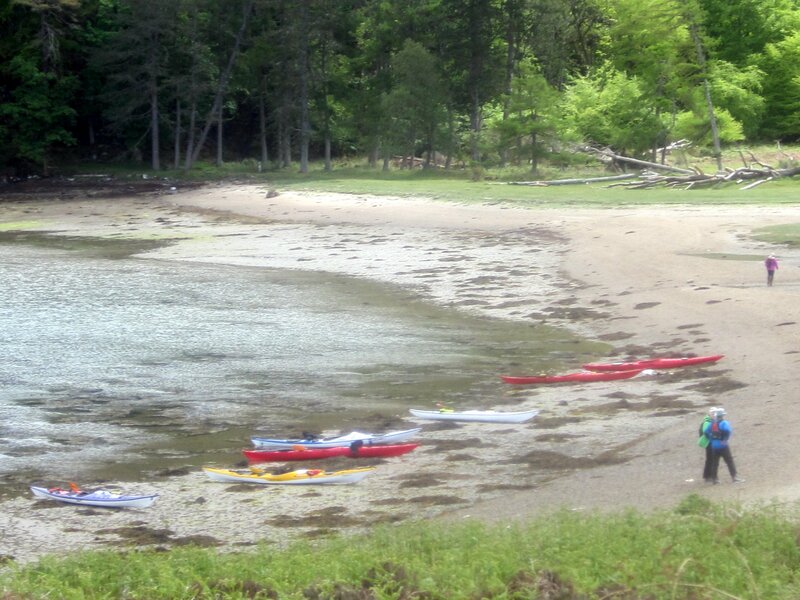 We paddled on with the wind, stopping at a lovely beach just at the exit of the loch. 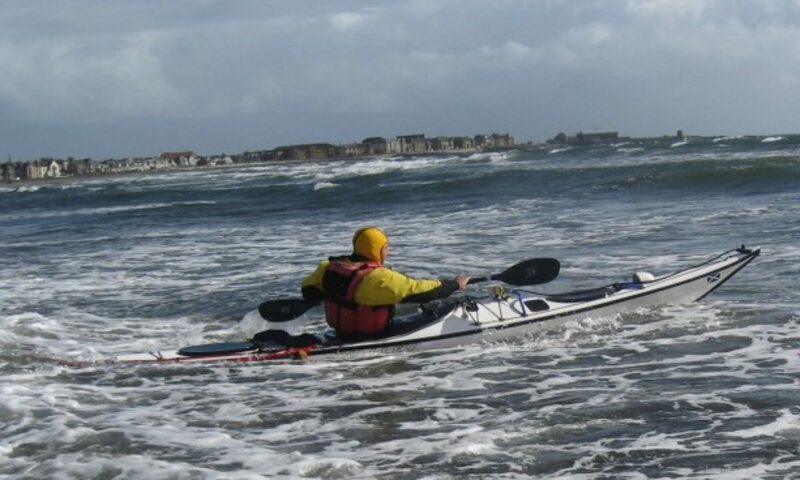 A short break and then on along the north coast of Shona to the North Channel. This section was surprisingly quiet, with little wind or swell. 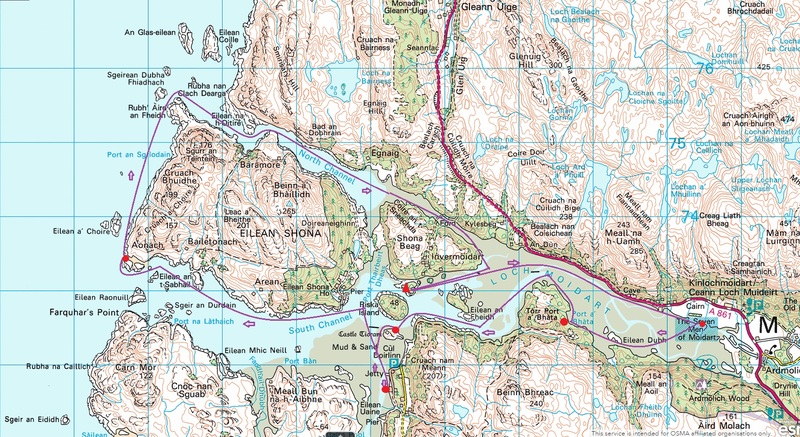 The North Channel is an impressive cut between Shona and the mainland that dries at low water. We traveled in on the tide and the causeway was well covered. 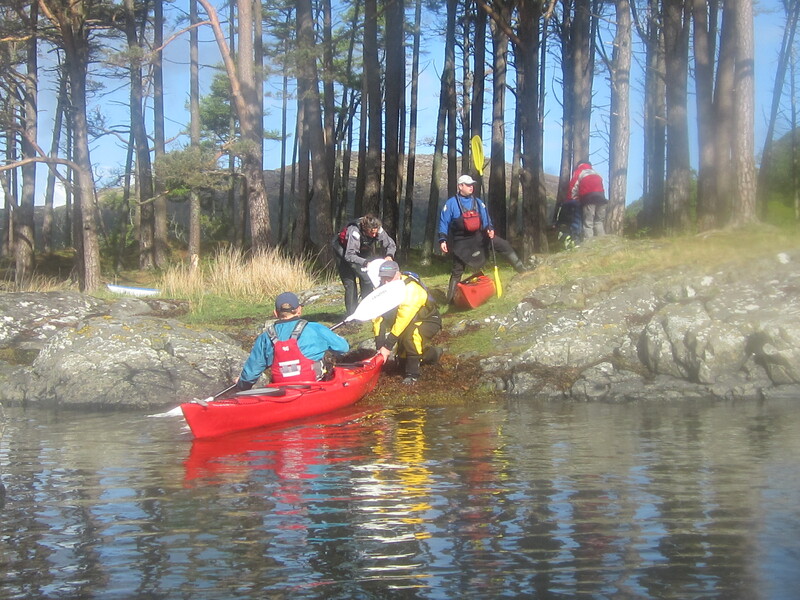 Rounding the south east corner we headed for our favourite campsite on an islet just off Shona. There was heavy rain and wind in the night but all survived unscathed. 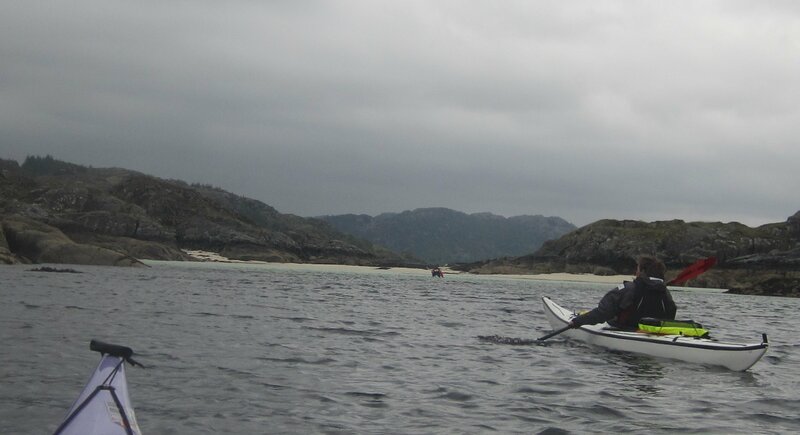 With the frisky wind(F4 and gusting) it was decided to simply explore the loch and then head back. 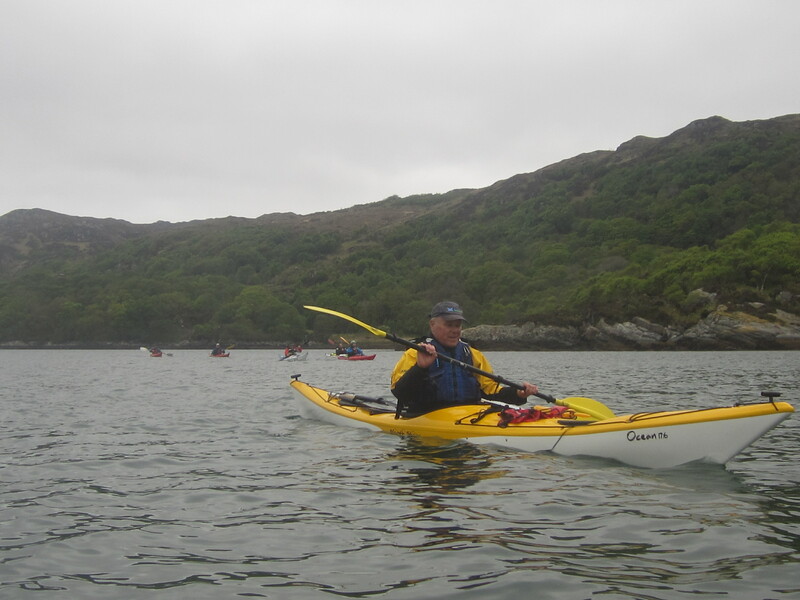 It was now high tide so we headed for the memorial to the Seven Men of Moidart, prominently identified on the OS Map. We landed twice near the bottom end of the loch but both landings required a 0.5 km walk to a cairn. Unbeknownst to us we could clearly see the seven men (or at least two of them), a row of Beech trees planted to commemorate the seven men who landed in Moidart with Bonny Prince Charlie in 1745. 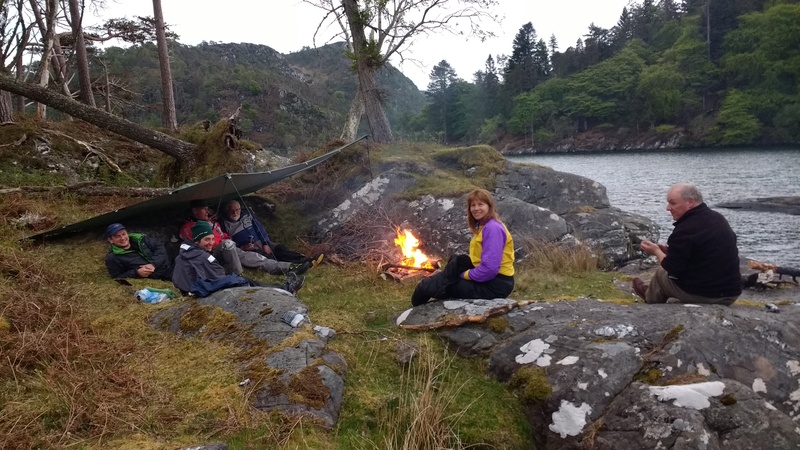 Fuller information with photos is given at https://www.moidart.com/history-moidart/seven-men-of-moidart . 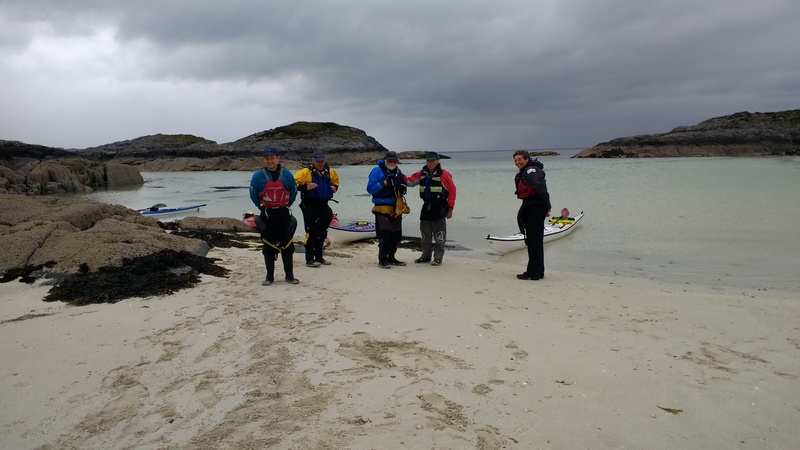 Because were worried about the loch drying we got back in the boats and retreated, landing at a small rocky beach marked as Port Bhata for our first lunch. Much to our surprise there was a number of ruined cottages, field walls etc in a location with apparently little natural resource. 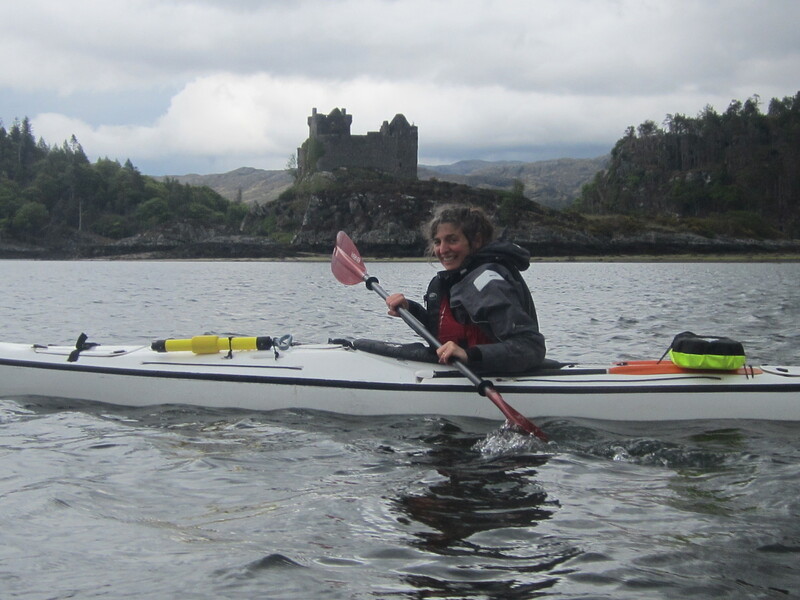 From Port Bhata we headed for Castle Tioram, a spectacular island ruin at the end of a causeway that dries at low tide. You can still get inside the castle through a small gate marked “extremely dangerous”. As noted in the latest condition report this rather exaggerates the dangers and it is worth entering to admire the various rooms and ante-chambers that still survive. Comprehensive information on design and history with lots of photos including aerial shots can be found at https://canmore.org.uk/site/22511/castle-tioram. From the castle we paddled back to our launch site, reloaded the cars and headed back to the car park for our second lunch. 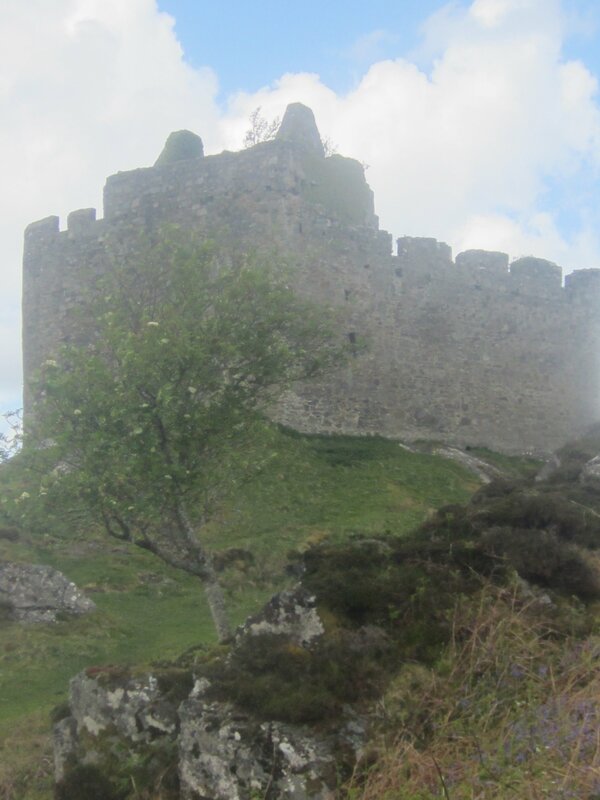 The sunny, warm, windless beautiful location was complemented by a wonderful Sea Eagle sweeping and swirling around the castle. Sadly the power steering fluid in Hugh’s car decided to exit the vehicle for reasons currently unknown. The journey back via the Corran ferry was fast and unhindered, although the weather across Rannoch Moor was as bad as anything I can remember, with lashing rain driven by storm force winds. Just a reminder of what we might have got into if we had not been prepared. Was it worth the drive? Undoubtedly. 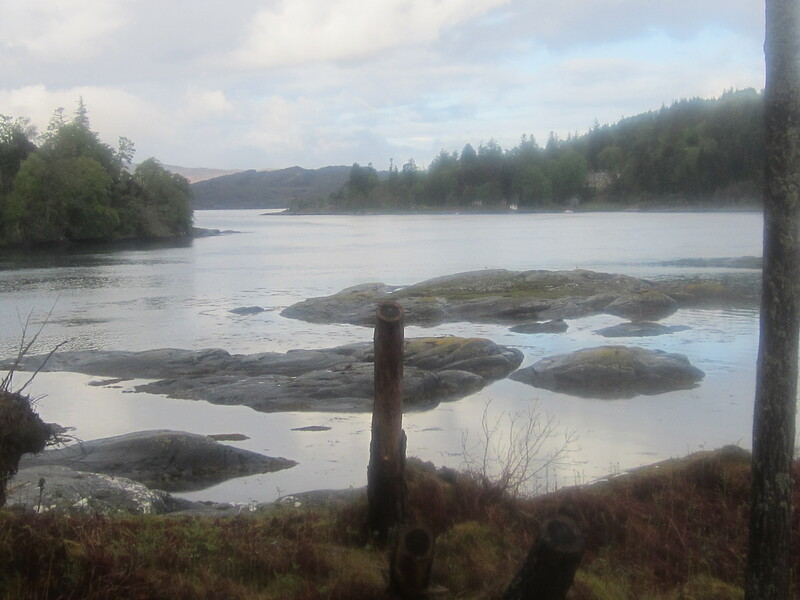 Moidart is spectacularly beautiful even by west of Scotland standards. 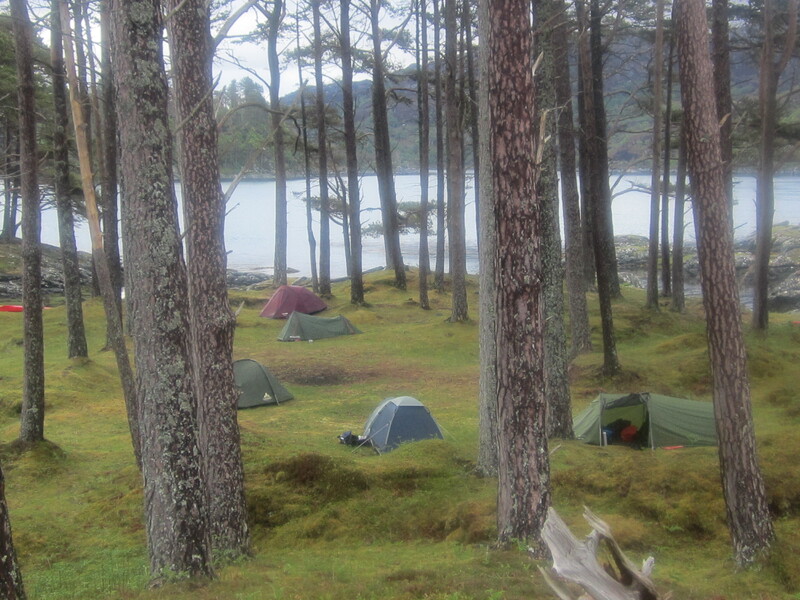 The camp site is close to perfect and the company was excellent. A great weekend.